Hey guys welcome back on the blog. Recently I was asked by my dad for some help, the problem was pretty straight forward. My dad uses a Nokia C5-03 phone and he uses a 4GB memory card in it. While he was using the phone all of a sudden it got corrupted and interrupted in the functioning of the phone. After attaching the microSD card to the computer I found out that it is corrupted and I had to format it, but all the valuable data in the phone was lost such as photos videos and documents. So I was asked by my dad to recover those files. Therefore I used some of the lesser known software packages in the market and found some amazing results. These software belong to the personal, commercial and forensics area. So lets start the debate. Note: this is not a performance test, this has been carried out to extract the data only and does not adhere to the performance showed! Recuva is a piece of software which isdeveloped by Piriform. It is available in two versions, Free and professional. For my purpose I used the free version. This software was on my top list whenever I wanted to recover lost files on any type of drive. 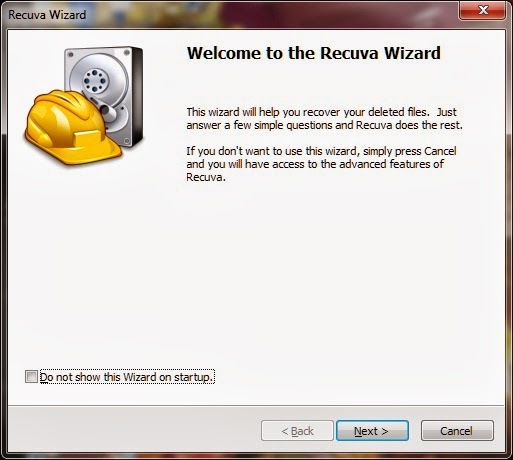 I have used it a couple of times and already wrote a blog post back in 2013 you can check it here for the full working knowledge Data recovery with recuva. My reason for choosing Recuva was the easy availability and the ease of use. When I started using this for the corrupted memory card or micro SD I was surprised to see that it worked and found some files too it was around 29 in total. But there were a lot more files on that card and it failed to recover or find them. I tried both the methods the basic and advanced method but none of them helped; it found only some application files which were of no use to me. After the disappointment from Recuva I thought if this can’t search anything then no other free software could find the files. So after brainstorming for a while I thought of using some forensic tools. After which I found this software CnW Data Recovery which has been developed by CnW recovery Developments Ltd. It acclaims to be a forensic data recovery tool which can recover any type of file on any type of digital storage media be it Hard disk, flash drives floppies anything. So I thought of giving it a try. When I started the application there was a catch, it was a demo application and needed to be registered [to be bought]. In the demo version the whole recovery process was working but it only gave the preview of the files, one cannot recover files on the demo version. So I thought to just check if the files can be recovered or not. To my surprise it found all the files on the my card and I was able to see them too. So overall the application did worked pretty well, but the sad truth is that it’s a demo application and needs to be purchased to recover the files. I even tried to do some research to get the complete application but failed to do so. 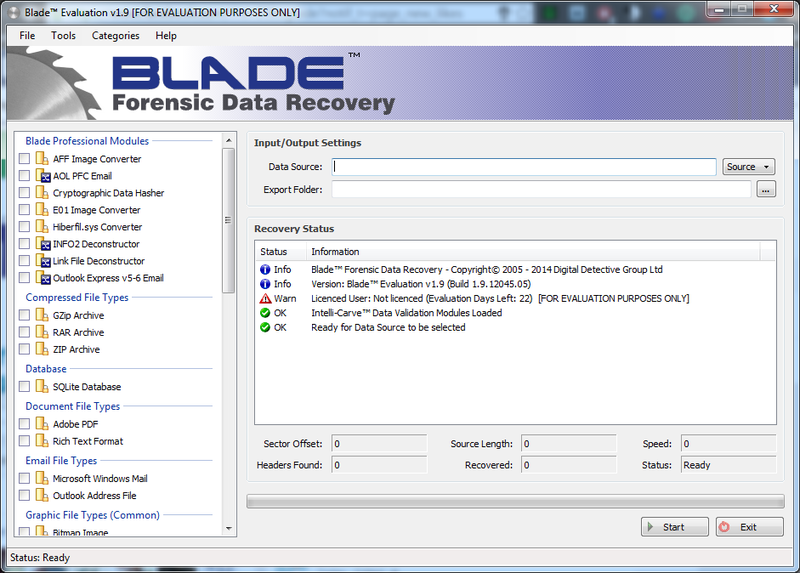 As the name suggests it is also a forensic data recovery tool, it is again a professional grade tool which has been developed by Digital Detective Group. The same catch is here like the above application, this application runs in an evaluation mode for the next 30 days after that you need to purchase the software. But it can save life of a target audience who have 10 or less files of each type they want to recover[during the evaluation period], which means that the user can recover and save upto 10 files only of each extension or file type. Well the application is very nice I loved the whole layout and the working, while recovering it searched for the files and found all of them and was saving them simultaneously in the desired output folder. It kept each file type in an individual folder. It recovered like 350 files approximately but saved only 10 files of each kind. Impressed by the task I thought of researching it over the net and found that the software can only be activated with a hardware dongle which needs to be purchased from the site and then it will be delivered to the user. They have securely implemented the security of the app so that it can’t be activated by just anyone. But what if you are in a hurry and want to recover files as soon as possible? Well the answer to this is that you can’t start right away; you need to purchase that dongle to fully activate the program. So the people in haste I feel sorry for you. It is a physical device and you need to wait until it’s delivered to you. This is another piece of software which has been developed by Panterasoft, on its website it boasts about the capabilities it has, of recovering files from the flash media and hence named it Flash file recovery. It brags itself in recovering files from dedicated camera memory cards and other flash devices files ranging from JPEG, RAW, TIFF, AVI, MOV, MPEG many more. So after installation I gave it a try I selected my drive and clicked next and started the scan. Check the next software for the full review and comparison. 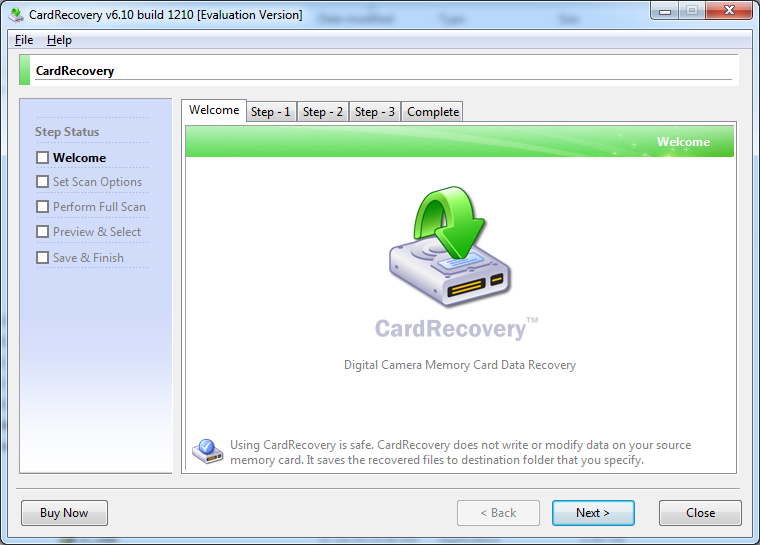 This is the last app I’m reviewing; it is called CardRecovery which is developed by WinRecovery Software. While using this application one might find that it will only recover your digital images and videos residing in the card. So it limits the file types. Well it suited my needs as I only needed to recover the images and videos in the memory card. Again it is an evaluation software and the company suggests that you try the evaluation version before purchasing the software as in some cases it might not recover the desired files. It gives the functionality to the user to view the files before recovering them. After starting the recovery process it blew my mind as at that time I was running two recovery softwares simultaneously to recover the files. To give you an in dept knowledge the files reside in the sectors and all these sectors needs to be scanned to recover the files. 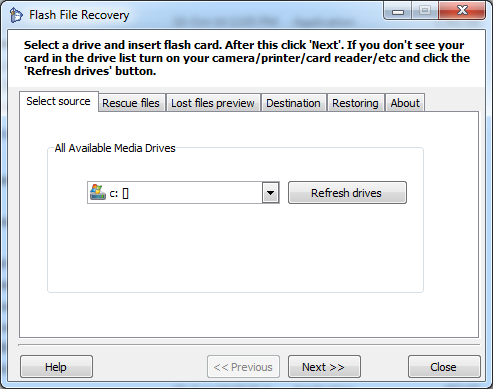 One of the software was this CardRecovery and other one was Flash File recovery. I started Flash file recovery much earlier than this one after that I started CardRecovery program and started the process. To my surprise the sector scanning was pretty fast on the CardRecovery and it was catching fast with the sector scanning of flash file recovery. After a while CardRecovery left flash file recovery far behind in the sector scanning count . And it started showing the files too with details such as type of file and creation date and model of the camera and preview of file too. Therefore I decided to stop the process of Flash file recovery and the sector count drastically increased in CardRecovery. After a while when the process was completed CardRecovery found almost 350 files in total but I couldn’t save them [evaluation period]. Therefore I decided to do some research for the app and found it and after that again running the whole process it saved my files, a few old files were affected but they were too old and I didn’t needed them I only needed the files which were created latest by. Personally i would like to recommend this application to the people. If you like this blog post please do comment below and tell us your views. Have any other recovery software in mind that you know tell us and we will review it for you!!! !